For several election cycles, Pew Research Center has documented the extent to which Americans are turning to social media for political information and action. The current political environment – featuring exceptionally high levels of interest in the election, partisan antipathy and political polarization – makes for an especially complex atmosphere for today’s social media users. The typical social media user inhabits a digital world that contains a wide mix of connections, ranging from close friends and family members to public figures or distant acquaintances. Often these friend networks represent a potentially combustible mixture of conflicting political opinions, and this intermingling of the personal and the political can lead to frustration and annoyance for users as they attempt to make their way through these digital spaces. The chapter that follows examines the basic contours of how users encounter and navigate political discussion and debate in the context of social media. Roughly one-third of social media users indicate they often (9%) or sometimes (23%) comment, discuss or post about government and politics on social media; meanwhile, nearly seven-in-ten indicate that they hardly ever (30%) or never (38%) do this.1 Younger adults tend to rely much more heavily than older adults on social media as a source of campaign news, but older users more than hold their own when it comes to discussing or commenting on political issues on these sites. Some 10% of social media users ages 50 and older often do this, nearly identical to share of users under the age of 50 who do so (8%). In addition, Republicans and Democrats who use social media (including independents and other nonpartisans who “lean” toward the parties) are equally likely to say that they often comment, discuss or post about political issues on these sites: 10% of Republican users and 8% of Democrats do so with this frequency. In addition to asking about their participation in political discussions on social media generally, the survey also included a series of questions about the composition of users’ friend networks and the political content they encounter on two specific social media platforms: Facebook, which is the most popular social media platform by a substantial margin (used by 62% of American adults) and Twitter, which is smaller (used by 20% of Americans) but has attracted an audience that is heavily invested in news and current events. This survey finds that Facebook and Twitter users tend to follow a very different mix of people – but political content is equally prevalent for users of each site, and users of both sites are connected to people holding a broad range of political viewpoints. The vast majority of Facebook users indicate that their Facebook friends are either mostly people they know personally (66%) or are a mix of people they know and don’t know (30%). Just 3% of Facebook users indicate that most of their friends are people they do not know personally. By contrast, Twitter users report that their networks are much more oriented toward public figures and other users that they themselves do not know. 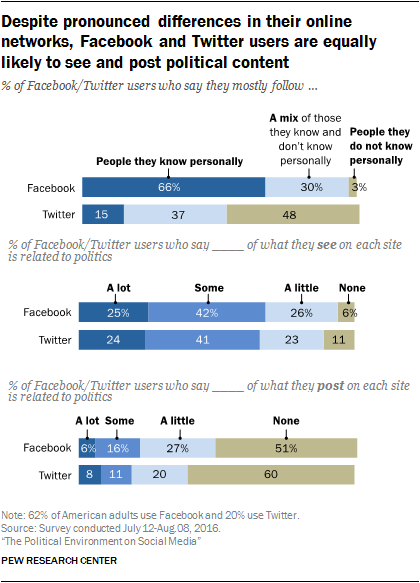 Just 15% of Twitter users say that they mostly follow people they know personally, while nearly half (48%) say they mostly follow people they do not know personally and 37% say they follow a mix of people. Yet despite these differences in the types of people they follow (and Twitter’s long-standing reputation as the domain of news and politics junkies), users of each platform report that they encounter a similar level of political content and discussion. The vast majority of users of each site indicate that they see at least a little bit of political content in their feeds, and about one-quarter of both Facebook (25%) and Twitter (24%) users report that “a lot” of what they see on each site is related to politics. Meanwhile, 6% of Facebook users and 8% of Twitter users indicate that “a lot” of what they themselves post on the site is politically related. In other words, users of Facebook and Twitter are equally likely to encounter political material and to engage in political discussions – regardless of whether they are on a site where they are mostly connected to people they know personally (as in the case of Facebook) or on a site where they are connected to a wider range of people they may or may not have ever met in person (as in the case of Twitter). In addition to being exposed to a relatively substantial amount of political content from a range of differing people, users of both Facebook and Twitter must navigate interactions with people holding a wide variety of political viewpoints. 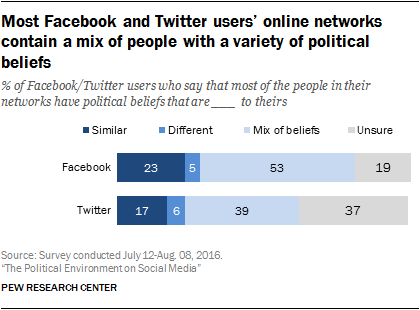 To be sure, some users have online networks whose political views largely mirror their own: 23% of Facebook users and 17% of Twitter users say most of the people in their networks hold political beliefs similar to theirs. And a notable proportion of users simply don’t pay much attention to the political characteristics of the people in their networks: 19% of Facebook users and 37% of Twitter users say they are unsure of the political beliefs of their friends and followers. But for many users, friend networks that encompass a range of political beliefs are the norm. Roughly half of Facebook users (53%) and more than one-third of Twitter users (39%) say that there is a mix of political views among the people in their networks. And an additional 5% of Facebook users and 6% of Twitter users indicate that most of the people they associate with in these spaces hold different political beliefs from their own (Note: a Pew Research Center survey of news consumption habits conducted in 2014 similarly found that Facebook users are exposed to a relatively broad range of posts that they agree and disagree with).